My wonderful kids got me an Amazon Echo Dot for Father’s Day. This is an awesome little toy. Alexa (the thing’s voice) can play music and set a timer and tell me jokes and do math problems and lots more. It didn’t take me long to discover that Alexa could read books in my Kindle library. So of course I told her to read one of my own books–in this case, Terra. The first problem was that she insisted on narrating all the front matter–copyright statement, ISBN, etc. There should be a way to turn that off or skip through it, but I couldn’t figure it out. Then she started reading my deathless prose. She will not be replacing professional audiobook narrators anytime soon. The meaning is reasonably clear in her narration; she pronounces the words correctly (except for the oddball name “Polkinghorne”) and she pauses between sentences. But her emphasis was consistently a bit off: she said “post OFFice” instead of “POST office”; “cell PHONE” instead of “CELL phone”. And she didn’t do dialog right: you need to drop your voice a bit when you come out of a line of dialog to identify the speaker: “Larry said” or “Vinnie said”. She didn’t do that. And of course she made no effort to characterize the speaker; they all sounded just like Alexa (she sounds great, but she doesn’t sound like Larry Barnes). I couldn’t imagine listening to her for a whole novel. I gave up after about a page. By the way, one of the most popular posts I’ve written is the one where I contemplate whether Jeff Bezos is the Antichrist. Apparently people Google that question a lot, and my opinion comes up second, just after Jonathan Franzen’s. Maybe I’ll ask Alexa what she thinks. PORTAL on sale for 99 cents! A Terrific Read! I wasn’t sure what to expect when I started reading this. Would the promising story idea deflate once it got past the initial set-up, as so many other books do? It definitely did not, and stayed entertaining all the way through – I could not put it down. I have kids around the same age and I really felt for these boys – they’re lost and are doing whatever they can to stay alive, stay together and hopefully get home. Glad the book was complete in itself, but it would be great to see them have more adventures like this. Overall, two very enthusiastic thumbs up! I originally named my novel “Portal”, but my publisher thought that one-word titles weren’t commercial, so they talked me into “The Portal”. But now that its sequel TERRA has debuted, we have decided to use “The Portal” as the name for the entire series. At the same time we changed the novel’s title to single-word upper-case PORTAL; it’s also now Book 1 in The Portal Series. I’m sure sales will skyrocket. Also, the new cover, featuring the new name, has made its debut on Amazon, although the softcover version still features the old cover. That will change before long. My publisher liked the cover we came up with for TERRA. (They also seemed to like the uppercase letters.) So they suggested coming up with a comparable cover for The Portal and change its title to PORTAL, which was okay with me because that’s the title I came up with in the first place. The paperback version of Terra is now available! By the way, we’re in the process of coming up with a new cover for The Portal to give us continuity in the series. I’ll post a draft when we have it. And it’s a good one! A really intriguing and rather different coming of age story. Alternate universe, strange portals to travel through and a planet called Terra. Earth, but not Earth. A place where the Roman Empire never fell, although with some very big differences. The first being that power resides in the hands of the priests, who control the portal, the Via. A schism has developed in the priesthood with the head priest (pontifex) attempting to corrupt the ideals of the finder of the portal and original priest of the order. This is the second book of the series, having not yet read the first story of Larry and his portal hopping I was concerned it would be difficult to follow. It wasn’t. There were enough explanations to give one a basic understanding of what had occurred in the first episode so that the characters motivations could be understood, without destroying the suspense and giving away the previous storyline. 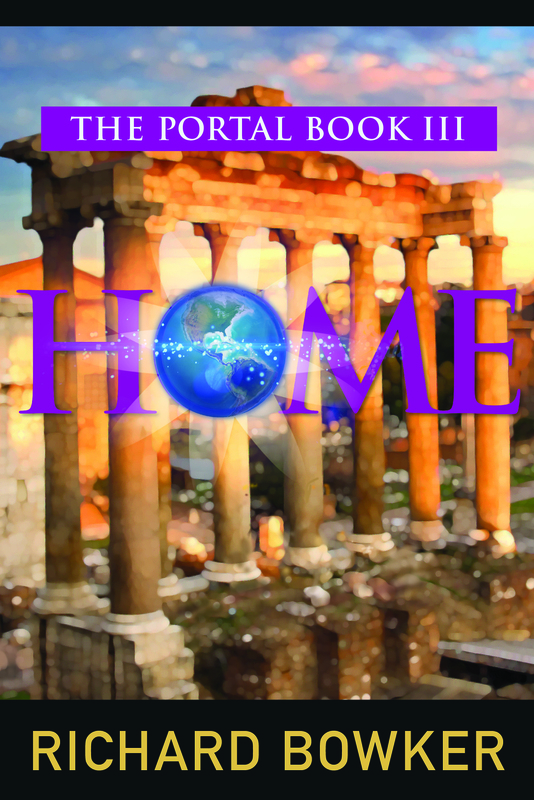 The combination of alternate universe travel, the Roman Empire still existent, some wonderfully complex characters, a high level of suspense and many twists made for an edge-of-the-seat read. One of the many tough things about writing a sequel is trying to make the novel intelligible on its own. I’m glad to see this reader enjoyed Terra without having read its predecessor. Should I create audiobooks of my novels?